Check out the Bitcoin business directory. Bitcoin has a woman problem that, unless solved, will keep it from hitting the mainstream as a medium of exchange, at least in the US. The following conversation is primarily aimed at the particular challenge Bitcoin faces in getting to mainstream adoption, and is not focused on the speculative rises and falls that have dominated the news cycles for the past few weeks in particular. 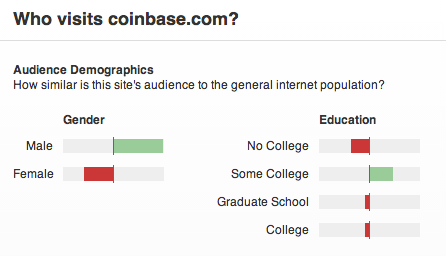 Right now (Dec 2013), the overwhelming majority of activity in the Bitcoin space is dominated by males. In doing a review of the market for consumer activity, and then comparing it to the market at large, it is clear that there is a significant gender gap that will need to be filled before Bitcoin can hit the mainstream as a payment mechanism in any meaningful way. 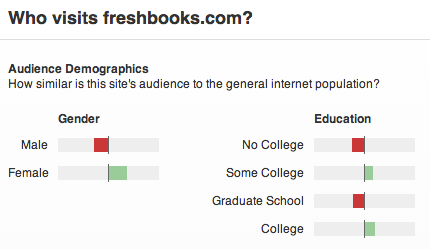 Although all web statistics of this type are prone to some margin of error, these are certainly directionally correct. On the customer side, one needs to have a wallet in order to spend bitcoins. The two largest web wallet providers, as measured by number of website visitors, are Coinbase and Blockchain.info. If we look at their demographics as measured by Alexa, both significantly oversample as male. In other words, both sites have significantly more visitors who are male than the typical web site, and have significantly fewer visitors who are female. 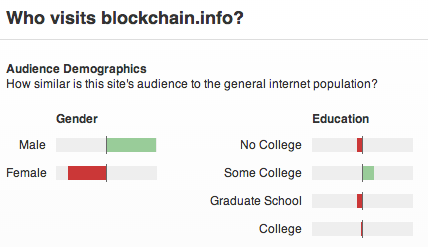 It is clear that a vast majority of the individuals with web-based Bitcoin wallets are males (particularly males with “some college”). If we look at Coinbase’s own data that was shared in a post yesterday, this seems to bear out. Coinbase states that their user base is about 88% male, which seems to mesh pretty well with the Alexa data above. Finding #1: A vast majority of the potential spenders of bitcoins today are males. The merchant side of the Bitcoin market in the US doesn’t look very different. The two main players in providing services that enable websites to accept bitcoins as payment are Coinbase and BitPay. 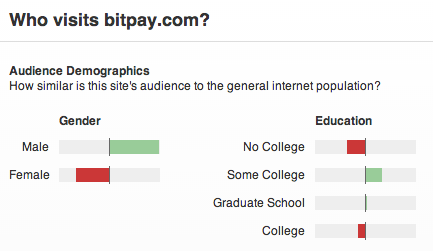 Using the same process as above, we find that BitPay also skews heavily male. It’s not currently possible to split out Coinbase’s merchant traffic from their consumer/wallet traffic, so the same information is used to assess the Coinbase merchant gender skew as was shown above. 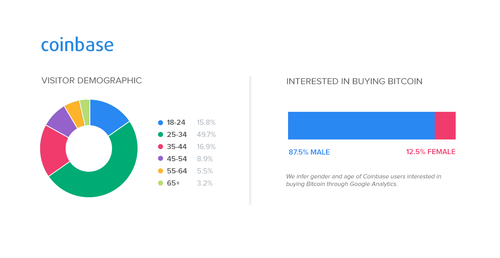 Finding #2: A vast majority of the potential merchants that are accepting bitcoins today are also male. Now, let’s step back from Bitcoin and look at the broader market itself. Who manages businesses (especially small businesses)? And, more importantly, who makes the decisions about spending money? As measured by number of organizations, most businesses in the US are small businesses. There are a few data points that come into importance here. The first is US census data around small business ownership. The most current figures available are from 2007. This information shows that 45.7% of the small businesses in the US are either woman-owned or equally owned by men and women. Perhaps more telling is who is running the numbers for those businesses. 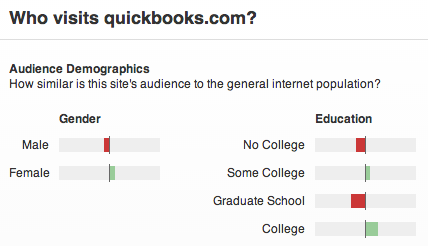 In doing a spot assessment of two popular accounting packages for small business, Quickbooks and Freshbooks, we see that the users of those websites skew female. Finding #3: Women are at least 45.7% of the owners of small businesses, and are the primary users of small business accounting software. Now, here’s the big one. Women control 90% of household finances, including major purchases such as houses and cars, according to Business Insider. Business Insider shows that, overall, women account for 85% of consumer purchases. These statistics align with other data, such as this research from BlogHer that shows women control 85% of discretionary household spending and this article from FastCompany that claims 80% of US spending is controlled or influenced by women. Finding #4: Women control household finances and consumer spending decisions in the US. So what do these findings mean for the predictions that Bitcoin could become a significant medium of exchange? They mean that Bitcoin is going to need to find a way to cross the chasm from technology enthusiasts and get real traction in some aspects of the visionary female market to have any hope of reaching the mainstream. There are a few ways that the Bitcoin community can address this issue. First, Bitcoin needs to move from speculation, trading and talk of mining and conversations of terahashes/second and instead be able to clearly demonstrate utility to female consumers and business owners. What is the practical, pragmatic reason to use Bitcoin? If I’m a business owner, why is accepting Bitcoin 10x better than current payment methods, including PayPal (which, incidentally, also skews female)? Current credit/debit cards, while a pain, do the job “well enough” in most cases, so much so that even other conceptually similar products have challenges getting widespread adoption (e.g. the number of merchants who accept American Express is far lower than the number who accept MasterCard/Visa). The current exception is a provider such as Square that gives small business owners an easier way to take these existing cards in places or situations where the existing infrastructure wasn’t doing the job, and at a better cost. What is the thing about accepting Bitcoin that will be the “aha” moment for the significant percentage of the women who own or manage small businesses that will get them to add one-more-thing to their already hectic days? And, more importantly, what is the thing about Bitcoin that will compel the female customer to give it a try? What are the examples out there today that will be the future case studies of great things that female consumers could do because of Bitcoin that they couldn’t do another way?